November 25th, 2009: Cloudy, Cool and Nasty, Water Temperature 54* and Clear. Caught bait early and picked up the guys at 6:30, put out a spread of boards and pulled mid lake flats and points. This morning it was foggy and damp, the sun did not come out till we came in this afternoon. The bite was slow today but we fished hard to catch these few Stripers. Usually the youngest [Eli] catches the largest fish but today his mother had the honers. Nice stringer of Stripers caught with Anthony in a couple hours this morning. November 19th, 2009: Cloudy,Windy, Rain and Hail, Water temperature 55* and clear. Got out early and hung a lantern for bait. Caught all I needed in a few throws , went back to pick up my light and the top on my boat hit the bottom of the bridge, creating a slight tear over the rail support. Seems the lake rose over the hour I was there this morning. Picked the guys up at 6:30 and went fishing. Before I could get my spread out the board closest to the bank went off and Roger grabbed it, fought it well and we boated the fish. I continued to put the baits out till I had 10 boards, a bobber and a downline in the water. We hit a flat and 4 baits got real nervous but the fish would not hook up. After a couple hours of action Roger hooked up with a nice fish while the wind was blowing and a luck would have it my trolling motor decided to break. I worked on it for a few minutes, restored power but the steering was shot so I called my wife and asked her to bring me my spare TM. I steered by hand for the next 30 minutes until she arrived. We continued to work flats, humps and points with similar results, about a third of the hits we would get would actually hook up. Anthony was also out in his boat today and was having the same results until he called me on the radio and said "You better get prepared, I am getting pounded over here, with Hail!" Two minutes later it hit us and the storm was quite impressive. Wind and marble size hail rocked us for 15 minutes, thank God I had put the top on the boat this morning. Anthony called back and said that all the bait and fish had gone straight to the bottom of the lake. We could only imagine what that storm would have looked like from a fish's perspective, looking up and seeing and hearing the hail hit the water. Within 2 minutes the lake was white. We continued fishing until 12:30 , I was out of bait, we had gone through 35 baits so we decided to go catch more. Within 30 minutes I caught 28 more and set up in a different area. The leaves were so bad today from the lake rising and the water pulling the leaves off the bank every minute of the day I was constantly shaking leaves off my planner boards. We fished till we had all had enough and decided to call it a day, and what a day it was. Not only was the day very eventful, we were all in good company, had a lot of fun and the fishing was Great. The few mini fronts that blew through today stalled the fishing temporarily but it wasn't long before it would pick right back up. Roger is shown holding a nice Striper he wrestled in the boat. We caught and released some very nice Stripers today, the guys keeping a limit to take home. Here is Sara with her first deer[s]. Her daddy Steve has been practicing shooting with her all year in anticipation of taking her hunting in muzzle loading season. Today was their first chance to get out and Steve called about an hour before dark to see if they could come over and give it a try. They got up in one of my stands while I was driving in the driveway from my trip today. 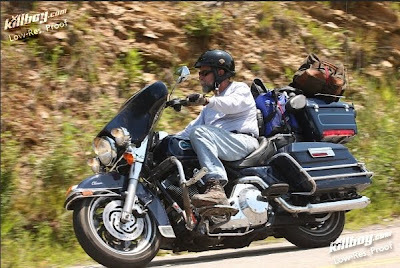 While I was posting my journal about our fishing trip today I heard a KPoww,, immediately got a call from Steve that she had laid one down. He said he was going to reload in case another deer came out in the field. About 10 minutes later I called him and he did not answer, and I knew why. KPoww, then he called all excited, she just shot her second deer. They came up to the house and Sara was as calm as she could be, we got my Doberman and went to check on the deer. Sara had dropped the first deer in its tracks, shot through the heart, my dog tracked the other deer about 30 yards and it to was shot through the heart. Two perfect shots! Great job Sara, we are very proud of you and your expertise with a firearm. Not bad for an 8 year old. I just am a little concerned though, I don't know if Louisa County can handle another " Seay" hunting! November 2nd, 2009: Cloudy then Blue Bird Skies, Water Temperature 62* and Clear. Picked the guys up at 5:30 and went to catch bait. Threw for 4 hours with no results, the sun came out , the bait bunched up and 3 casts later we were fishing. The first ledge I pulled over 4 out of 5 rods started shaking, only one hooked up but it got off before getting to the boat. We pulled the mouths of creeks, across points, hit humps, basically fished from Stubbs Bridge all the way to the 522 Bridge and other areas and caught 5 Stripers. I hate to make excuses but I think we missed the early morning bite and once the front came through the fish turned off. We were glad to get the 5 fish. 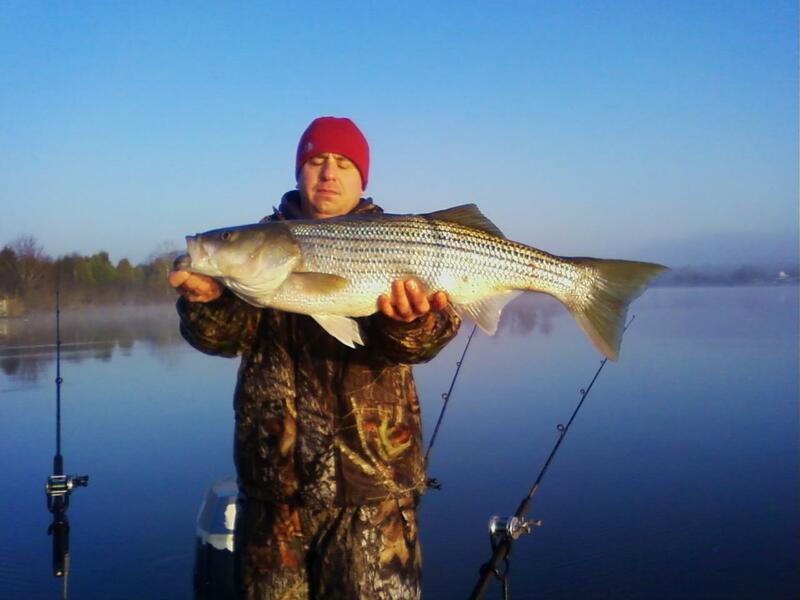 Christopher is pictured with his first Striper. The Goochland Gang strikes again! These are some die hard Striper fisherman who fish the lake every chance they get. They are on the water in the wee hours of the morning collecting bait and spend long hours looking for and catching Stripers. They teamed up fishing out of Ricky's, Timmy's and Roger's boats and herded these Stripers up to catch this beautiful stringer of fish. 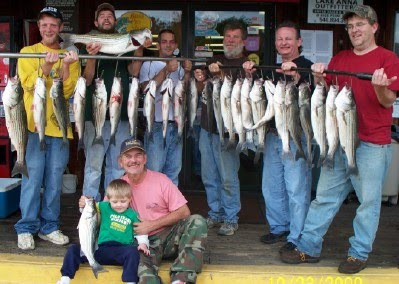 Timmy is holding the largest Striper of the day, Ricky is holding his grandson Dean. They all have big smiles on their faces but little Dean gets the last laugh, he caught the big one today. If the guys had a bet on the largest fish of the day Dean would have some cash for his piggy bank. Congratulations guys! October 23rd, 2009: Cloudy and Warm, Water Temperature 63*and Clear. Picked the guys up at 6 and went and caught bait. Set out a spread of boards and downlines and worked a shallow flat this morning hoping to catch fish up feeding. We pulled about 400 yards before we had our first hit. Within a few minutes baits were getting clobbered, the guys were running around the boat, most of the lines were getting tangled and the only one to boat a fish was Sam. I straightened and retied the lines, turned and made another pass with similar results. By now we had lost 5 or 6 fish and only had a Sam's fish in the box. I reviewed with the guys again how to work the fish once we hooked up and hit the point again. Pop hooked up with a freight train, it took him around the boat while Steve worked his fish in and around 3 other rods. I netted Steve's fish but in the excitement Pop somehow lost a nice one. Turned around and hit the same point again and Sam hooked up and boated his fish. We worked the area until we ran out of bait, went and caught some more and set up on some similar structure. By now the sun was out and the fishing slowed down. We worked our way back to the point where we had previously caught the fish and took a couple more hits before calling it quits for the day. Today we had a minimum of 30 strikes, most of which hooked up and the guys took home a few for a fish fry at the lake tonight. This is a Buck that I have observing for about 2 weeks now. I have 100 acres of land in Louisa and maintain 14 food plots through out the property, using trail cams to take pictures of the animals that use the plots. These particular pictures are fron 2 cameras, one under a set of Persimmon trees and the other a long trail in the woods planted in Whitetail Imperial Clover, under a stand of mature White Oaks. The deer over the last few weeks have decimated the clover to the point that it is only about 2 inches tall now and have kept it mowed to that height for the last 2 months. There are 2 Oak trees dropping acorns into the plot and the deer are eating them as quick as they fall. There are very few Oak trees producing on my property this fall, I think these 2 are due to all the lime and fertilizer that I have spread in the area. I have over a thousand pictures of other deer from the 3 trail cams on the property and about 50 more of this particular deer but I thought these were the most interesting, chronicling the movements of this Buck. I was worried this Buck was going to leave the property soon with the rut not far away and I knew if we were to harvest the deer it would have to be soon. The weather was changing drastically, there was a major cold front moving in today, the weather was cold and getting colder, and it was going to rain for the next 3 days. I called up 3 other hunter friends and invited them over for an afternoon hunt, hoping someone would get a chance to bag the Buck. I got into a stand on a trail that led to one of my plots and at 5:45 a doe and her 2 fawns came by and started feeding in the plot. Soon after I heard some grunting and a 6 point passed by following the does. A little after 6 the does got nervous and started looking up the trail, at which point I saw a larger Buck coming in. The does and smaller Buck took off as the larger Buck approached. I waited for the Buck to give me a good shot, I watched him for 5 minutes before he turned quartering away from me at 40 yards and I let an arrow fly. I heard it score , he ran up the hill 50 yards and I heard a very loud crash. We recovered the deer about an hour later, the shot was true and it was obvious the deer did not suffer. Pre rut deer are relatively easy to pattern, especially with trail cams, and with a little luck on our side our plan came together. Enjoy the photo's of this deer. October 14th, 2009: Cloudy and Cold, Water Temperature dropped to 67* and Clear. Picked the guys up at their dock at 6 and went and caught bait. Checked a few areas before locating catch able bait, threw a couple dozen times and went fishing. Set up where I knew some nice Stripers were cruising with a spread of 10 planner boards, a bobber and a couple of downlines. We pulled some very shallow flats early looking for feeding fish but none would cooperate. I kept noticing some action on the surface about 1500 yards away so I turned the boat and headed for it. When we got in the general vicinity our baits got nervous , boards started backing up and we started taking hits. On our first pass most of the baits on the boards either got boiled or got hit. We boated a few and turned around to hit the area again but the fish had moved on. I had to guess which way they went, we must have zigged when they zagged because I could not located them for another hour. Once I did I was prepared for them , I had gone and caught 45 more fresh baits, retied all my lines and reviewed with the guys what to do and how to handle numerous hook-ups. We found the school and talk about confusion, rods were bending all around the boat, people running around the boat, Bill shouting out to Al and Jerry which rods were hooked up, everyone working together to handle the action. Once I looked up and Al was holding 2 rods with fish on them at the same time wondering what to do. Bill is on Oxygen and when he would hook up Jerry would grab the tank and follow Bill around the boat while he fought his fish. A couple of times after Jerry landed his fish he wanted a hit off of that Oxygen tank, but he would get side tracked with another strike. We would loose the school for a couple minutes and find them again repeating the same scenario over and over again. We had 27 fish hook up today, lost a couple that screamed the drag, lost a few others that we simply could not get to in time due to not enough hands in the boat. All the fish today were very nice Stripers, we did not have to deal with catching punks today and by the end of the day the guys could not believe what had happened to them. Al said he had never caught so many big Stripers before and Jerry is still wondering about the bait I was using! A cold front is moving in tonight, I am going to go home and try to bag a Buck this evening. October 1st, 2009: Partly Sunny and Cool, Water Temperature 74* and Clear. Picked the guys up at 6 at the marina and went to find bait. Bait was tough again this morning and by 8:30 we finally had 25 pieces so we went fishing. Set up a spread of 10 Water Bugz planner boards, a bobber and 4 downlines and worked a flat where I new some nice fish were using. We made pass after pass on the flat getting strikes every time. On the first pass we had 4 different fish boil the baits but would not take them. We worked the area till noon, then we were forced to leave. There is this pesky Osprey that loves to harass us by diving on our baits, picking up one, flying under all the other lines then when he ascends he ties up all the lines and lifts the rods out of the holders, almost throwing them in the lake. This is the third time in 2 weeks that this has happened. Well today he messed up all the rods and we had to loose our baits and retie and untangle the lines leaving us with no bait to fish with. After straightening the lines out we went to look for more bait. I found some deep but could not catch it due to the water being so clear so I went to where I caught it this morning and found some shallow in 4 feet of water and made a cast catching about 30. Yea! I asked the guys if they wanted to go back and work the area we fished this morning or try a new area, they opted for new. I set out the spread and pulled a couple mile stretch taking a few hits and boating a couple more fish. Today we had 17 fish on but could only boat 9, for whatever reason? I would expect October fishing to really turn on next week and resume the great fishing that we have enjoyed all year. August 25th, 2009: Sunny and Pleasant, Water Temperature 85* and Clear. The guys wanted to see how bait was caught so I picked them up at 3:30am and went and caught bait. After watching what I go through with bait I believe they may have changed their minds about trying this on their own. We picked up Roger and went in search of schools of Stripers. I looked for a hour before finding what I wanted to see. The guys were getting a little antsy, it was quite cool this morning and the picture I painted for them was me finding schools early and reeling in fish, not cruising looking for fish. The water Temp had dropped 3 degrees since Saturday and had repositioned the fish shallower than I had expected but once I found them I dialed right in on them and we worked 7 schools within the next 3 hours. We went through 200 baits this morning, caught 19 Stripers and a dozen Catfish. The lake reminding me of the beginning of July with all the fish we saw and the numbers of schools we found. On the way back to the marina I was still marking schools of Stripers. Hope this continues through September! August 22nd, 2009: Cloudy and Warm, Water temperature 88* and clear. Caught 220 baits this morning and picked the guys up at 5:45 and went in search of Stripers. Found a school and we put out 10 downlines. No sooner than the last bait hit the water Brian hooked up. Great way to start the day with Brian catching the biggest fish he had ever caught. Well for the next hour he put it on his dad and Bill catching most of the fish. We worked a school of fish that was relating to a ledge, we would loose the fish and find them a few hundred yards again down the ledge. I had a friend Greg that was out and we worked the school for a couple hours this morning until the magical 9 o'clock showed up, then the schools scattered and the fish turned off. We looked and fished for a couple more hours only to catch 1 more Striper. Boat traffic got up around 9:30 also which did not help the fishing. We had quite the light show this morning with all the thunder storms rolling through but before daybreak the rain stopped and no one got wet. Not a bad morning for a cold front blowing through on a weekend. August 20th, 2009; Sunny and Warm, Water Temperature 88* and Clear. Caught bait early and picked the guys up at the state Park Cabin dock. Found a school early and worked it for about 20 minutes then lost them. Looked for other schools nearby but could not locate any schools. Set up on some pods of fish and had little success. Looked and looked and never could locate any more schools of fish and also fished numerous places where I would see a few fish and bait but could not put anything together today. Although the day was slow the guys caught 7 Stripers and had a great time. August 19th, 2009: Cloudy morning turning into Sunny, Water Temperature 88* and Clear. Got out early and caught 200 Herring, picked the guys up at 5:45 at High Point. This was the first day back on the water in two weeks so I resumed where I left off catching Herring and searching for schools of Stripers. It is getting daylight about a half hour later now so I took that time to show the guys how to deploy the lines. Found a small school nearby the marina and tried to set up on them but as usual the first set up is very slow and it took way too long to get the baits down so we lost the school. I assured the guys that every time we set up it will get easier and things will go faster. I looked some more and found a very large school, the guys started setting up and I called John to the school. This time it went a little better, we started popping Stripers and when John got there he saw the school about 150 yards from me and they started catching fish as well. After about 5 minutes John looked over at me and we both threw both hands up in the air, we both were frustrated because both of our sets of clients were still green and having difficulty getting the baits out properly because this was only their 2nd set up and John and I knew that if we could just get all our lines out we could slay the fish in this huge school. We worked the school for about 30 minutes and eventually lost it, so I got back on the motor and started looking again. I located another large school in the mouth of a creek and told the guys that this time they knew exactly what to do and we would spank the Stripers. They jumped up, got all the lines out to the exact depth that I called out and everything went off. At one time I looked on the deck and there were 5 Stripers on the floor still with hooks in their mouth's and they were reeling in others. Well I only had 10 lines out so by the time we removed the hooks from the fish , rebaited and got all the lines back out we had lost that school. By now it was about 9am, and I was getting worried that it was time for the schools to break up and quit feeding. I got back on the motor and looked for 3 more hours for fish, stopping often to fish some singles but in the next 3 hours only caught 1 Striper. For the last month the scenario has been pretty much the same, better catch them early and while they are schooled, after that it is just a boat ride. Kurt is pictured holding a Bass he caught on the old road bed out in front of the marina's, looks like he was mad but he wasn't, he just looked that way a lot today. The guys were having a bet to see who would catch the next keeper but it only applied to Stripers. That bet may go on for the next year, after they made the bet we never caught a keeper or could ever locate a Striper to fish! We kept 9 Stripers for a picture and released the rest, the guys did not want to take any fish back with them. August 5th, 2009. Sunny and warm, Water Temperature 85* and Clear. Caught bait early this morning and picked the gang up at high Point at 5:30. Showed them how to deploy the baits, found a school of fish and put the baits out. The girls in the back started hooking up and enjoying catching stripers. We lost that school after 20 minutes so I found another and did the same drill again. We hit 6 schools of stripers this morning, catching fish out of all of them until about 9 o'clock, then the fish simply turned off. Everyone enjoyed the fishing while they were biting and these fish were all the girls could handle. I am showing pictures of the girls holding fish, they caught most of the fish today. Bruce took home 12 Stripers for the freezer. August 4th, 2009: Sunny and HOT, Water Temperature 85* and Clear. Since I had a hard time yesterday catching bait I was on the water very early looking for bait. Caught 220 and picked the guys up at High Point at 5:30am. I told them how important it is to deploy the baits exactly like I tell them to and showed them how to do it. I also explained that if they listen to me and do exactly what I say, we should catch 50 Stripers before they shut off which lately has been around 9 o'clock. I looked for about 5 minutes and found a huge school. As it always is on our first set up of the morning everyone is slow and making mistakes, the way I fish is different than what people are accustomed to. We tried to get 10 baits in the water but the fish would not let us, then David threw a 25" fish back in the water. I explained to them that this time of year when the stripers are schooled tightly that if you release that size fish back into the school it alerts the rest of the school and the school will disperse and shut down. I had no sooner said that and the depth finder went blank. These guys were quick learners so we pulled our baits up and went in search of another school. Took about 3 minutes to locate another school, set up on them and caught 7. Lost them, looked for 3 more minutes and found another school and this time the guys were ready, we worked on that school for 25 minutes before 2 guys in a small boat saw us catching fish and pulled up on us, so we gave them that school and went and found another. This school ended up being larger than I thought and everyone hooked up at once, with 27 to 30 inch fish. We had fish going every direction , rods everywhere on the boat, fish all over the floor, then I called the ball, we had our limit in the cooler and had to stop. Not bad timing, we had gone through 200 baits, caught at least 30 keepers and a few non keepers, kept 20 Stripers and released the rest to fight again another day. These guys SPANKED the Stripers this morning , all by 8:15, A GREAT DAY OF FISHING! I am seeing schools of Stripers positioned and acting like July 1 fish. The lake is still about 1 month behind this year [ One fish was releasing eggs in the livewell]. The month of August should be a great month to fish, unlike past years, I believe the best summer fishing is ahead of us.